The three day workshop on Soft computing, was held at GEC Sreekrishnapuram from 9-11 th January 2014. It was organized by IIST Trivandrum. Eminent personalities from IIST, IIT Delhi and M.S.U Baroda gave sessions on topics Genetic algorithms, Neural networks, Fuzzy logic and Data-mining. The workshop was inaugurated by Dr.P.C.Reghu Raj, Principal of GEC Sreekrishnapuram. First session was based on Fuzzy logic by Dr.Deepak Mishra, IIST Trivandrum and is followed by another wonderful session on Google Page Ranking algorithm by Dr.Sumitra.S.Nair, IIST Trvandrum. First day of workshop came to an end with a session on Artificial Neural Networks by Prof.Raju.K.George ,IIST Trivandrum followed by a lab session. On Second day there was a great session on Genetic algorithms by Prof.V.D Pathak, M.S.U Baroda. And then there was a session on ‘Theory of Kernal Methods’ by Dr.Sumitra.S.Nair ,IIST Trivandrum. Second day ended with a lab session on ANNs. Third day session mainly focused on Data Mining and It’s applications. The session was by Prof.B.Chandra ,IIT Delhi.It was an interesting session. The three day workshop came to an end with the distribution of certificates to all the participants by Prof.B.Chandra and Prof.V.D Pathak. Paper got published in IEEE Explore. 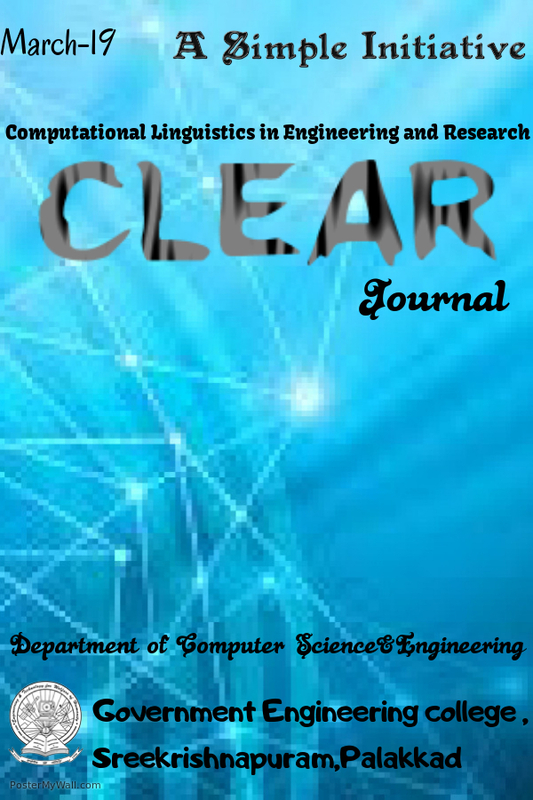 We are inviting thought-provoking articles, interesting dialogues and healthy debates on multifaceted aspects of Computational Linguistics, for the forthcoming issue of CLEAR (Computational Linguistics in Engineering And Research) magazine, publishing in September 2018. Varsha E and Sreelakshmi K of 2016-18 batch got placed in Lymbyc Solutions Private Limited, Bangalore for the post of Data Analyst, NLP. Jenny Georeg and Nasreen K V of 2016-18 batch got placed in SysG Soft Solutions, Kakkanad for the post of Junior Machine Learning Programmer. Nijila M and Nayana R M of 2016-18 batch got placed in ElkanIo Research Labs, Kochi for the post of Associate Data Scientist. Sruthy K Bhaskaran and Rahul M of 2016-18 batch got placed in UVJ Technologies, Kakkanad for the post of Associate Software Engineer. Three day workshop on " Research Methodology and Intellectual Property Rights"
Placed in A.C. Kunhimon Haji Memorial ICA college.